Background: Age, one of the key biomarkers among the nonclinical parameters of cardiovascular diseases (CVDs), has the greatest effect on the development and progression of CVDs. Objectives: The current study was done to evaluate the effect of age on cardiac rehabilitation (CR) patients’ attitudes regarding the main cause of their condition. Patients and Methods: The administrative data of this cross-sectional study were obtained from the database of the CR department of a hospital in Iran. The demographic and clinical information of 901 patients was obtained from January 2004 and January 2012 using compiled forms of this database and the structured clinical interview for Axis I Disorders (SCID-I). Univariate analysis of variance and Bonferroni post-hoc analysis were used for the data analysis. Results: After adjusting for gender, it was revealed that significant age differences existed between patients who perceived no specific risk factors (62.43 years) and those who viewed biological (55.0), physiological (57.31), behavioral (57.85), and psychological (57.25) risk factors as the main cause of their condition (P < 0.05). The age differences between those who had no perceived risk factors (62.43) was significantly different from patients perceiving biological (55.0) and environmental (62.03) factors to be the main cause (P < 0.05). Conclusions: Although older patients need more self-care and the quality of this self-care originates from their attitude toward CVD risk factors, their lack of awareness about the main risk factor of their condition is a major challenge for secondary prevention measures. In addition, younger patients’ significant emphasis on biological risk factors as uncorrectable factors can reduce their sense of responsibility toward attempting to control correctable risk factors. Correcting these patients’ attitudes regarding CVD risk factors can result in better responsibility feeling by the patients and can improve treatment outcomes. Cardiovascular diseases (CVDs) are considered one of the most common chronic conditions globally (1). Currently, about 15 million persons in Iran suffer from CVDs, and millions of those in the general population are at risk of developing CVDs (2). In Saeidi et al.’s models (2), there are five classes of CVD risk factors, namely biological (gender, age, and family history), environmental (dust, toxic fumes and substances, and polluted water and air), physiological (diabetes mellitus, high blood pressure, hyperglycemia, and obesity), behavioral (unhealthy diet, cigarette smoking, narcotic drug abuse, low physical exercise, and physical work stress), and psychological (rage, stress, anxiety, and depression) factors. These factors, apart from their direct impacts on the development and emergence of CVDs, might also affect patients’ perspectives on health. As Perkins-Porras et al. (3) have noted, patients’ casual beliefs regarding cardiac diseases are significantly related to actual risk factors. Nevertheless, it seems that some factors could affect the beliefs and attitudes of cardiac patients on the risk factors involved in the illness and lead to the development of inaccurate perceptions. For example, there are gender differences among patients, causing female patients to attribute psychological factors and male patients to attribute behavioral factors as the main causes of their diseases (4), while this might not be accurate. In such conditions, the inconsistency between the perceived and the actual risk factors might affect patients’ cognition and intensify their anxiety (5). Other factors that might affect patients’ views and beliefs include their socio-economic status (6), physical conditions such as deafness (7), comorbidities such as diabetes (8), and psychological-behavioral issues (9). Patients’ age could also be a factor. As one of the biomarkers of CVDs, age has the highest effect on CVDs’ progression among the non-specific parameters (10). It is obvious that the risk of developing and sustaining CVDs increases with age (1) and this issue illustrates the necessity of studying the views and attitudes of patients of various ages on their disease. Previous findings have shown that older patients believe that the development of heart problems is inevitable and they have no role in controlling their present conditions (11), while younger patients believe they are at risk of developing future heart complications (12). These findings show that patients’ age might play a role in their perspectives on CVD risk factors. On the other hand, according to the “the health belief model, patients’ perspectives (13) and their cognitive beliefs and emotional reactions to the disease and its treatment (14) independently predicted their health behavior. 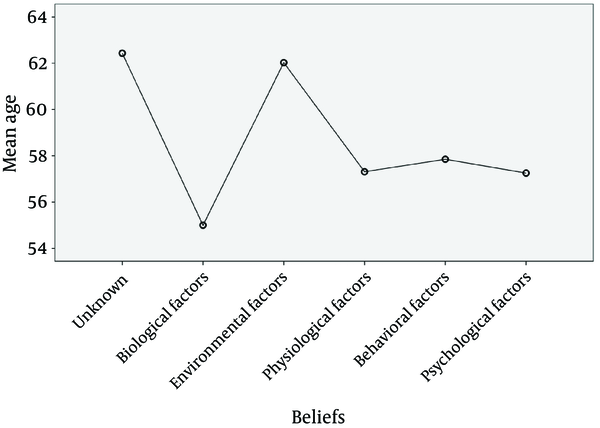 Therefore, with respect to the fact that the effects of many variables such as patients’ gender on the casual beliefs and their views on the risk factors involved in the disease have already been explored in a number of studies (3, 4, 15) and limited studies have assessed the effect of age on patients’ perspectives on the main risk factor for the disease, the present research was conducted. To evaluate the effect of age on CR patients’ attitudes about the main cause of their condition. The design of the study was cross-sectional in nature. The administrative data were obtained from the CR Center of Imam-Ali Hospital in Kermanshah, Iran. The database of this governmental heart specialized center is comprised of information about cardiac patients, particularly coronary artery bypass graft surgery (CABG) patients who have been registered in CR programs post cardiac event. Patients’ demographic and clinical information, including their psychological condition, comorbid diseases, and attitudes regarding the risk factors for cardiac diseases (or CVDs or their conditions) are registered in the database. The registration forms were designed by heart and health specialists and experts under the supervision of Kermanshah University of Medical Sciences. The university’s inspection unit assessed the accuracy of the data two times per year. Moreover, to evaluate patients’ psychological state (such as anxiety and depression), standard tools such as The Beck scales and structured clinical interview for Axis I Disorders (SCID-I) for comorbid diseases were used in the beginning and at the end of the CR program in this center. In addition, the psychologist asked patients one question on their attitude regarding the cause of their illness: “What do you think was the main cause of your illness?” These attitudes were recorded in 6 categories: 1) Biological; 2) Environmental; 3) Physiological; 4) Behavioral; 5) Psychological factors; and 6) I don’t know. Those who introduced heredity, age, and familial history as the main reasons for the diseases were assigned to the biological group, and so on. Patients’ choice of an environmental (dust, toxic substances and fumes, passive smoker), physiological (hypertension, diabetes, hyperlipidemia, overweight), behavioral (lack of exercise, nutrition, physical work, cigarette smoking, substance abuse), or psychological (stress, mourning and depression, anger and rage, spouse abuse) factor as the main reason for their acquisition of the disease determined to which specific group they were assigned. As a result, each patient was added to only one group according to their main perspective on the reason for their disease. Moreover, those who did not have an accurate perception of the cause of their disease and who could not attribute their disease to a specific risk factor were placed in the sixth group. Furthermore, for the illiterate patients, the self-report questionnaires were read by the clinical psychologist of the CR ward and their answers were registered. The inclusion criteria included the following: 1) between 30 and 80 years of age; 2) having no addiction to illicit drugs currently; 3) having no psychotic disorder. We identified 931 patients who participated in the CR program registered in an 8-year period between January 2004 and January 2012. After excluding 21 patients due to their failure to meet the inclusion criteria, the other 910 patients’ data were entered into the analysis. However, there was missing information in some of the responses, which caused the SPSS software to exclude 9 additional patients, and ultimately the sample size was minimized to 901 patients. SCID-I: This instrument evaluates the Axis I psychological disorders. This is comprised of six parts and is used to assess the diagnostic criteria of the 38 disorders in Axis I, including mood disorders, anxiety, and psychosis (16). Using the Chi-squared test, the nominal variables, including comorbid diseases among patients with different attitudes toward risk factors, were compared. The percentages relevant to distinct variables were also reported. For continuous variables, the means and standard deviations were reported. In addition, the univariate analysis of variance and the Bonferroni post-hoc analysis were used to compare the dependent variable’s condition among the groups. Applying the variance analysis using SPSS (ver. 21.0), the effect of gender was controlled as a fixed factor. A p-value of less than 0.05 was set as statistically significant. Of the 901 patients, 618 (68.6%) were male and 283 (31.4%) were female. The age ranges and means (± standard deviation) of the unaware group and the groups attributing biological, environmental, physiological, behavioral, and psychological risk factors as the main cause of their CVD were 32 - 80 (62.43 ± 10.1), 41 - 73 (55.0 ± 8.2), 38 - 75 (62.03 ± 8.1), 32 - 80 (57.31 ± 9.6), 37 - 80 (57.31 ± 9.6), and 33 - 80 years (57.25 ± 8.2), respectively. Moreover, 94% of the patients underwent CABG and 6% were patients who had received PCI or had MI or VHD. Table 1 shows patients’ other demographic variables of the sample study according to patients’ groups. In addition, details of the groups’ comorbid diseases are shown in Table 2.
aP-values of less than 0.05 are considered significant. According to Table 1, patients over 60 years of age compared with other groups show less awareness of risk factors (53.7% versus 14.3% generally). The results of Table 2 indicate that there was no significant difference between the groups in terms of their comorbid mental diseases and behavioral problems such as addiction, smoking, and drinking. However, there was a significant difference between the groups in terms of their comorbid physical illnesses. Univariate analysis of variance was used to compare groups’ age status after adjusting for gender. Regarding the calculated amount of F for the effect of the group equaling 6.089, there was a significant difference at least between two of the five groups in the age variable (P < 0.0005). Thus, the Bonferroni procedure of post-hoc analysis was used to determine in which groups this difference was significant. The results are shown in Table 3.
bP-values of less than 0.05 are considered significant. cP-values of less than 0.01 are considered significant. The current study was done to evaluate the effect of age on the attitudes of CR patients regarding the main cause of their condition. Consistent with the results of several studies (2, 4), the current findings indicate that a significant percentage of the patients were not aware of the cause of their illness. Most of the older patients (over 60 years of age), unlike the younger patients, were unable in identify the main cause of their disease. A few of them however, related their disease to an environmental risk factor. Consistent with the results of Saeidi et al.’s study (2), it was shown that compared to older patients, the younger patients (younger than 55 years of age) mentioned biological risk factors as the main cause of their disease. Although it seems natural to expect that being exposed to the medical environment and nursing teachings prior to outpatients’ CR initiation would improve patients’ knowledge on the risk factors of the disease and promote their beliefs and attitudes (17), older patients in the present study had no information on the main cause of their disease in general. The education degree of this group of patients is the main factor that could be argued. In our study, the highest illiteracy rate and lowest educational levels were found among old patients who could not hypothesize any reasons for their disease. According to Tovar and Clark (18), who claim that undereducated patients have less knowledge of CVD risk factors, older patients should express a lack of information on the risk factors due to their lower educational level. Such patients show less active participation in the hospital process, and in the case of active participation, their lack of education does not allow them to achieve a proper understanding regarding the risk factors involved in their disease. Ultimately, their inability to recognize the real reasons for their disease makes them believe that the development of future heart complications is inevitable; thus, they show no signs of hopefulness in their role to control the disease and its consequences (11), which in turn, can cause them to experience more anxiety in the near future (17). This situation indicates the necessity of providing specific education on the risk factors involved in the disease (13, 19) in a form that would be more understandable for undereducated older patients. According to the findings of the present study, a number of older patients believe environmental risk factors serve as the main cause of their disease. This result is consistent with Saeidi et al. (2) finding that patients over 60 years compared to patients under 40 years were 13 times more likely to ascribe environmental factors as the cause of their disease. As noted before, older patients do not believe they play an active role in controlling cardiac events (11), and this view makes them attribute their diseases to environmental factors that are beyond their control, such as dust and smoke. If another cause is suggested and patients are told their disease is due to controllable risk factors such as behavioral factors, they will encounter cognitive inconsistency and perhaps experience stress. Based on cognitive inconsistency theory, when an individual encounters two thoughts or cognitions that cannot exist simultaneously in one place and time, they feel stressed and confused (20). Therefore, it is clear that older patients introduce risk factors over which they have no personal control as the main cause of their disease in order to preserve their belief of having no active role in controlling their cardiac events. consistent with the result of several studies (2, 4), other findings have revealed that younger patients were more likely than older patients to introduce biological risk factors as the main cause of their disease. The results of one study (2) showed that younger patients were 13 times more likely than older patients to have biological attitudes. This group of patients’ view on the uncontrollability of the biological and genetic nature of disease makes them believe they are at higher risk of developing future heart diseases (12). They also believe that they have been victims of CVDs sooner than usual, which cannot be attributed to their negligence in controlling the risk factors that could otherwise be corrected or modified. Therefore, they introduce genetic factors as the main cause of their disease. The existence of this view in younger patients contributes to their negligence regarding risk factors that could be controlled and corrected and increases their likelihood of continuing harmful behaviors, including smoking or an unhealthy diet (21). In this group of patients, even the decision to participate in a CR program is influenced by their beliefs and attitudes on recognizing one specific cause for CVDs and the amount of their perceived control over CVDs’ development (11). By such type of vision and attitude towards the cause of disease, there is the potential of no participation of quitting CR program as well. This issue makes it essential to provide younger patients with specific education to change their views on the risk factors involved in their disease (2, 19). Offering consultation on the cause of CVDs might not only be able to substantially contribute to changing their behavior, but it could also change their psychological functioning. Therefore, correcting patients’ dysfunctional thoughts and perceptions to reduce their anxiety and depression can lead to significant improvements such as reduced medical expenses and improvements in patients’ quality of life; as such this is recommended as a part of CR programs (21). One of the limitations of this study was the retrospective nature of the data. Furthermore, we were not able to control all possible confounding variables. The other limitation was that the data were gathered only from one hospital in Western Iran. Therefore, we recommend surveying more samples throughout the nation in the future works. Although older patients need more self-care and the quality of this self-care originates from their attitude toward CVD risk factors, their lack of awareness about the main risk factors of their condition is a major challenge for secondary prevention measures. In addition, younger patients’ significant emphasis on biological risk factors as uncorrectable factors can limit their personal responsibility with regard to the attention they pay to controlling correctable risk factors. Correcting these patients’ attitudes can make them feel more responsible for controlling risk factors and can improve treatment outcomes. Authors’ Contribution: Saeid Komasi contributed to the drafting of the article, the analysis and interpretation of the data, the conception and design, and final approval of the version to be published. Mozhgan Saeidi was responsible for the data acquisition, the conception and design, critical revisions of the article to include important intellectual content, and final approval of the version to be published.